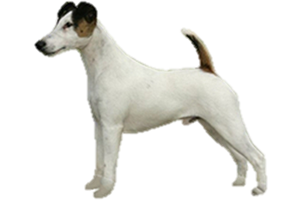 The Smooth Fox Terrier was developed to hunt with a pack of scenthounds. Its role is to bolt the fox from its den if it took to ground. Today they are kept primarily as companions. Traditionally all dogs that were bred to bolt foxes were known as fox terriers. The Smooth Fox Terrier is thought to have developed in England in the 1700s from the extinct Black and Tan Terrier with additions of Bull Terrier, Greyhound, Beagle, and extinct English White Terrier at various times in its history. When it first entered the show ring no distinction was made between the Smooth and Wire Fox Terriers; they were both considered to be the same breed and were interbreed for many generations. Although it is now believed that their ancestry is not shared the continual breeding (which was discontinued in the mid-1980s) has resulted in two breeds that are almost identical save for coat type. Is the Smooth Fox Terrier Right for You?